Are you a top managed services expert, entrepreneur, executive, community leader, coach or pundit? Or perhaps you know somebody who fits that description. Make sure they get the recognition they deserve. Complete the fifth-annual MSPmentor 250 survey by this Friday, July 27. We'll unveil the MSPmentor 250 honorees in August. Are you a top managed services expert, entrepreneur, executive, community leader, coach or pundit? Or perhaps you know somebody who fits that description. Make sure they get the recognition they deserve. 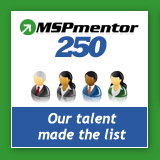 Complete the fifth-annual MSPmentor 250 survey by this Friday, July 27. We’ll unveil the MSPmentor 250 honorees in August.